Only last night, in an ucharacteristcally clear and cloudless Irish night sky, I saw an unflickering bright light moving west to east across the sky. My first instinct was that it had to be the International Space Station, which a glance at a tracking app I have quickly confirmed it to be. However, today I realised that the app might well have been in error, and that bright light was most likely something altogether more amazing, making its way on a journey from outer space to mingle with us mere Earthlings. Because today a most anticipated new timepiece, one which had previously only been spoken about in hushed tones at industry gatherings (such as Baselworld 2013) has been unveiled in its full 3-dimensional glory, the incredible Vianney Halter Deep Space Tourbillon. 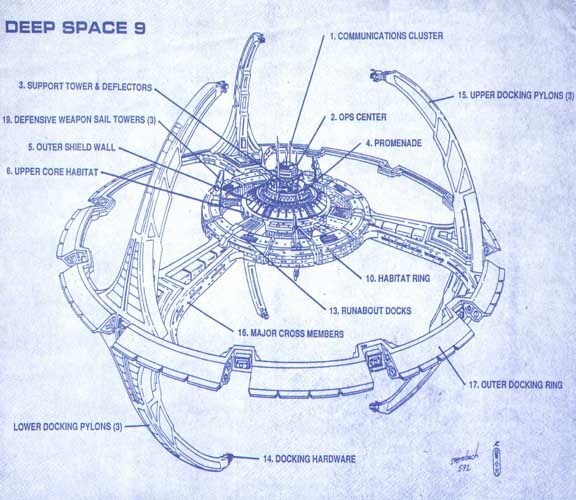 And it most definitely has its origins in science fiction and futuristic space travel! There are two reasons for the hubbub. Firstly, AHCI member Vianney Halter hasn't released a new watch in seven years, and back in 2007 as compared to today, the hype would have been low-key considering most of us were merely fantasising about watches and not writing about them, as blogging - or online journalism - as we now know it had not really begun to get steady standing on its own two feet. Secondly, Vianney Halter's watchmaking talents have made an extraordinary contribution to the industry. He is beyond compare. Most of us last saw him receiving his much deserved award for Best Watchmaker 2011 at the Geneva Watchmaking Grand Prix, charmingly disheveled in leather jacket and jeans and admirably passionate. Perhaps you know him for his steampunk styling. Perhaps you remember his part in the Opus 3 - so complex and innovative that it would take years to translate his vision into reality. Perhaps you are unfamiliar with him - if so, you soon won't be, because this man will have wall-to-wall coverage over the next few days, on right up to the awards season, and rightly so. - So for those of you familiar with his work, is this what you might have expected? Who knows what to expect from a man who has clearly delved deep into the sci-fi archives for his inspiration for his Deep Space Tourbillon ! Viewed from a side-on profile, the Deep Space Tourbillon resembles exactly how I, as a child, would have envisaged a lunar scientific research base to look like. With it's profoundly domed sapphire encapsulating a working environment within, complete with it's pylonic structures towering high above the working platform, and at it's heart the industrious mechanical tourbillon nerve centre around which all else functions. 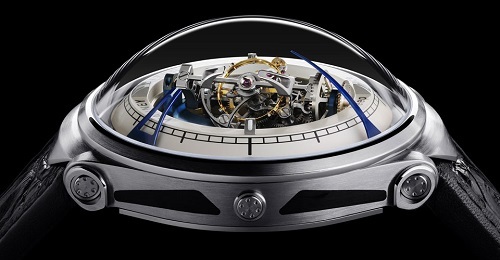 Naturally however, being Vianney Halter, his Deep Space Tourbillon is obviously going to feature something much more than just a tourbillon: centrally placed and completely dominating the watch, the triple-axis tourbillon is a mesmerising spectacle in 3D as its components twist, turn and invert themselves on its rotational course. The curved and elongated blue steel hands which crane over the minutes track - a styling cue lifted straight out of Star Trek's Deep Space Nine station docking pylons - are nonetheless an outstanding way to indicate time (solar time, of course...). But - aside from the few visible screws there is little steampunk-ish styling. It is clean, curved and more than a little seductive, a truly pleasureful timepiece.